Net Weight: Packet (400 seeds)1/4oz (6625 seeds)(+$7)1oz (26500 seeds)(+$15)1/4lb (106000 seeds)(+$57) This item is currently out of stock! Among the early hardy plants, Sweet William is outstanding as it blossoms between the late tulips and many other flowers. It�s erect tufts of handsome broad cluster of blossoms, like little pinks, with delicately fringed petals are merrily colored and marked. Excellent for beds, borders or cut flowers. 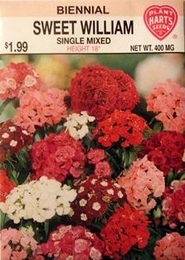 Sweet William plants started in July or August do not bloom until the second year. A protective mulch of straw or leaves should be used where winters are severe. Planting time - indoors 6-8 weeks before last frost for blooms in first year, mid-summer for blooms in the following year. Thinning - when plants are 2-3 inches tall thin to 6-8 inches apart.